lifetime with Alberta Wilderness Adventures! Our Alberta black bear hunting areas cover close to 8000 square miles of northwestern, Alberta, Canada, and has one of the highest black bear populations anywhere. 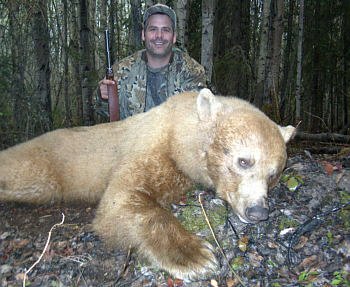 Much of the bear hunting area has never been hunted and continually supplies trophy bear of impressive sizes. Spring and fall bear hunts offer a 2 bear harvest with a very high success rate and and excellent percent of colour phase bears ranging from blondes to dark browns. These are great bear hunting areas and we are taking some real huge trophy bears each season. 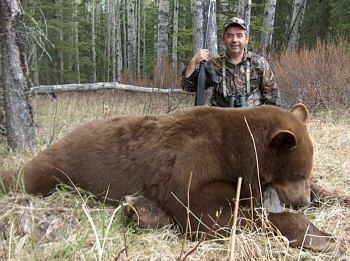 Spot & stalk Alberta black bear hunts always seem the most popular with success rates equalling any of the baited hunts. For these hunts we catch the bears feeding on berry patches, clover patches and on new grass shoots, which are all a big part of their diet. With several roads and trails with an abundance of feed you will have an extremely good chance of harvesting a huge trophy black bear. This hunt allows some movement and is more adventurous than the baited hunts. The most exciting of all bear hunts seems to be the spot & stalk, non-baited archery bear hunts where you may get the thrill of actually stalking your trophy while it feeds. We continually scout out prime active hunting areas. The spring hunting season runs from mid April to mid June. The month of May produces the best quality rugs and mounts. The fall hunting season runs Sept. 1- Nov. 30. September is the month to hunt these huge fall bear. They are feeding heavily, preparing themselves for the long winter, so they are heavier than spring bear. Their coats are thick with early winter fur. We try to place hunters during the prime time for the best black bear hunting. For your next Alberta spot & stalk bear hunting trip contact Louis Shilka at Alberta Wilderness Adventures and we will do everything we can to put you on the trophy black bear of your dreams . 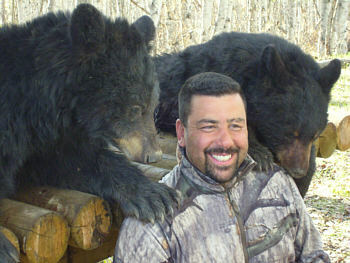 Two great trophy black bear taken by Joey on his spot & stalk black bear hunting trip. This monster brown colored black bear was over 8 feet and over 500 pounds. What a trophy for a non baited black bear hunt. A rusty blonde is a rarity in the color of bears and makes a beautiful trophy! We have one of the highest color phase black bears anywhere.